In September 2016, The Intercept published this image taken by a U.S. photoreconnaissance satellite of an unidentified city. An ellipse overlaid on the image showed the estimated location of a target Very Small Aperture Terminal (VSAT) satellite dish as determined by the GHOSTHUNTER program. (You can read more about GHOSTHUNTER in The Intercept's article: Ryan Gallagher, "Inside Menwith Hill: The NSA’s British Base at the Heart of U.S. Targeted Killing," The Intercept, 6 September 2016). A couple of days ago I decided it might be interesting to determine exactly where that city is. Knowing its location might enable us to discover which satellite — probably one of the massive ORION satellites in geosynchronous orbit — had produced the VSAT location estimate, and it would also enable us to make an accurate measurement of the ellipse. 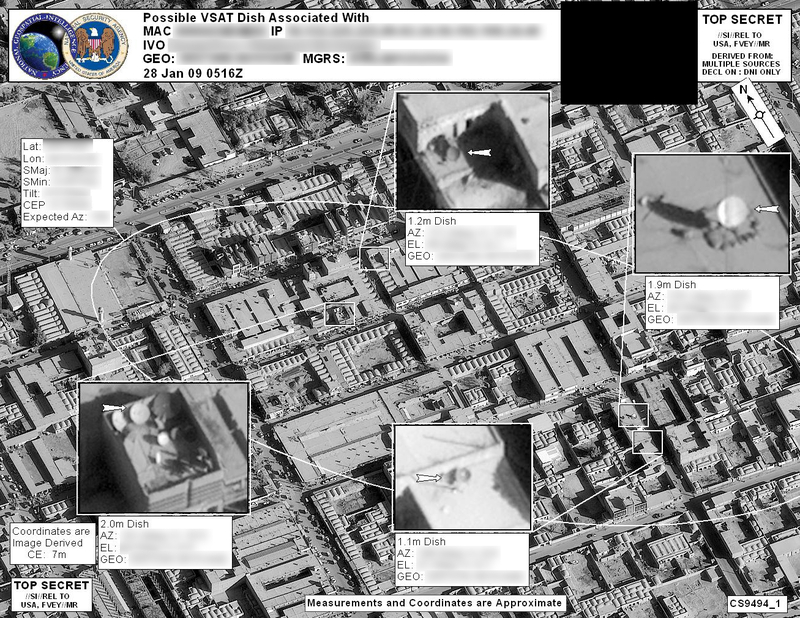 The location might also provide some insight into the kinds of targets these capabilities were being used against. But how to identify the city? My first thought was to use the shadows in the image. The exact date and time the image was taken (28 January 2009 at 05:16Z, with Z meaning Greenwich Mean Time) is shown on the image, and so is a north arrow. I figured measuring the direction of the shadows should enable me to determine a more or less north-south line on the globe along which the city ought to be located. 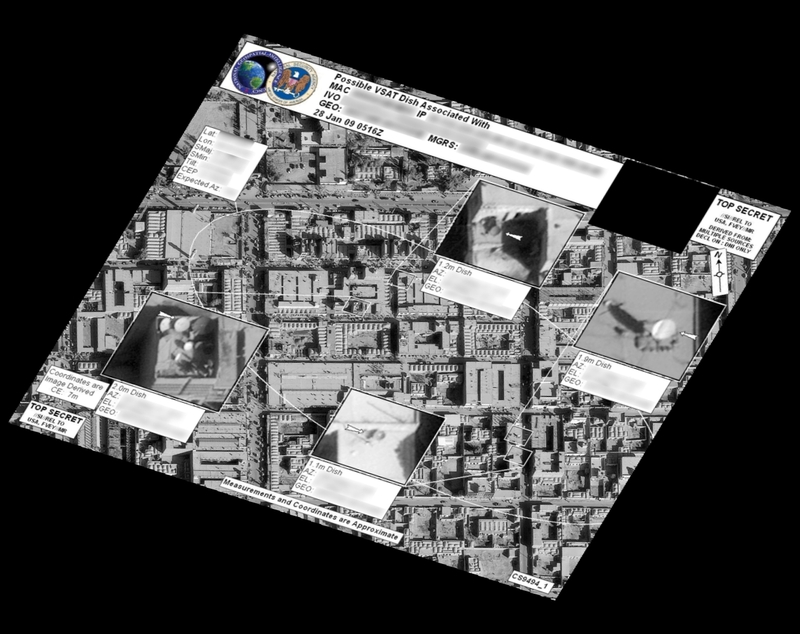 The tricky part is that the satellite photo was taken from an angle (which means, for example, that the streets don't intersect at right angles in the image, even though it seems likely that they do in real life), making it difficult to measure the angle of the shadows accurately. 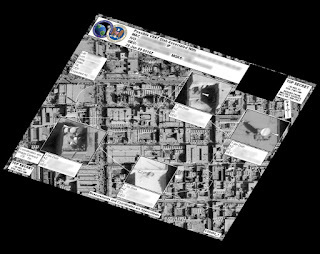 Skewing the image to make the street layout rectangular produced the image shown above, from which I determined the direction of the sun to be around 126.5 degrees, probably plus or minus at least a couple of degrees because of the imprecision of the whole process. That measurement in turn produced an estimated line of location that extended along the western shores of the Caspian Sea down through Azerbaijan and western Iran and across the eastern part of the Arabian peninsula, curving a bit to the east as it proceeded southwards. That seemed like a pretty good place to start, so I fired up Google Earth and had a look. Sadly, nothing I could find looked like the city in the photo. In fact, none of the cities near my search line featured architecture remotely resembling that in the image, with its numerous open courtyards and long sections of roof constructed of multiple vaults in series. Clearly something was off. So on to Plan B: Widen the search area and find the cities with that kind of architecture. I did find similar-looking vaulted roofs in parts of eastern Iran. But there was still no city that really resembled the target. Herat, in Afghanistan, however, was another matter. Although still not the right city, it was much, much closer to the right style. So it was time to take a closer look at Afghanistan. A point-by-point search of small cities in western Afghanistan led eventually to Zaranj, in the southwestern part of the country just a couple of kilometres from the border with Iran. 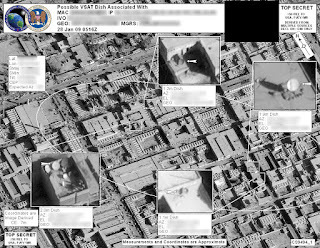 Here you can see the spy satellite image overlaid on the Google Earth image. It's a match! ...about 1000 km to the east of my initial line of search. So, what went wrong with the shadow method? It turns out the spy satellite image was not only skewed, it was also stretched along the east-west axis. As can be seen in the formerly circular logos in this version, the image had to be compressed to match the underlying Google Earth photo. That changes the angle of the shadows, which now indicate the direction of the sun to be about 135 degrees, not 126.5. A search along the line determined by that information, through western Afghanistan and Pakistan's Balochistan province, would have sped things up considerably. But I don't see any way to have determined the necessary correction ahead of time. 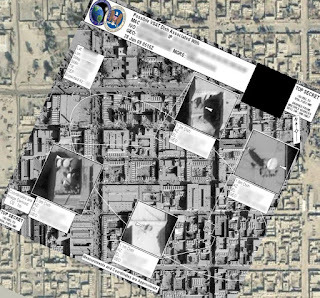 Anyway, we now have a spy satellite photo newly identified to be of Zaranj. Perhaps unsurprisingly, Zaranj turns out to be the kind of burg where a lot of activity that might be of interest to intelligence agencies takes place. This 2012 article, titled "The Scariest Little Corner of the World" (Luke Mogelson, New York Times Magazine, 18 October 2012), takes a fascinating look at the city and the region around it. Between the Hazaras, Tajiks, Pashtuns, Uzbeks, Afghan Baluchis, other Afghans, Pakistani Baluchis, other Pakistanis, Iranian Baluchis, other Iranians, Indians, Americans, other NATO forces, and, going back a ways, the Soviets, a lot has been going on. I won't even try to summarize it all here. As noted above, the ellipse on the photo shows the estimated location of a VSAT satellite dish that the NSA or other SIGINT agencies were monitoring and wanted to geolocate. Several candidate dishes that were found within the ellipse are highlighted, but it is not clear whether any of these dishes were singled out as probably being the target dish. The long axis of the ellipse is oriented towards the southeast at an angle of about 134 degrees, which is quite close to the direction of the sun at the time the photo was taken, but that's just a coincidence. What is probably not a coincidence is that it also points pretty much exactly in the direction of the U.S. ORION 2 geosynchronous SIGINT satellite. [Update 11 April 2018: Actually, it probably is a coincidence. As Marco Langbroek helpfully pointed out, the ellipse probably represents the location estimated by monitoring the VSAT dish from two SIGINT satellites at the same time, which means it very likely doesn't point in the direction of either one of them. As he noted, this document confirms that two satellites are used when making such estimates. So, sadly, it may not be possible to determine precisely which of the geosynchronous SIGINT satellites were involved in this case. The size of the resulting ellipse will vary in each particular case according to the geometry of the intercepts and other factors, but this example gives an indication of how precisely SIGINT satellites can geolocate a transmitting VSAT dish. As measured in Google Earth, the ellipse is around 207 metres wide by 465 metres long, and thus covers an area of about 75,600 square metres, roughly seven and a half hectares. The data box attached to the ellipse originally provided a figure, redacted by The Intercept, for CEP, which is an abbreviation for circular error probable. This probably means that the ellipse depicts the area within which the dish was estimated to have a 50% chance of being located. That's pretty impressive precision when you consider that these satellites orbit at an altitude of nearly 36,000 km and the slant range to their targets is even greater. There may be other details that can be learned from a close examination of this image, but those are the obvious ones that come to my mind. Suggestions for other points [and other corrections] would be welcomed. Nearly half a century after the first geosynchronous SIGINT satellite was launched (CANYON 1 on 6 August 1968), it's nice to learn a little bit more about how they operate.